A business may wish to hire foreign workers to serve customers in another market or they may need to hire someone with a particular skill set that is not locally available. Hiring international employees can be an effective employment solution, however, this can be a challenge for businesses that have not done so before. Employment laws are specific to various countries, the laws are often complex, and are typically designed to protect the employee, rather than the employer. HR, Finance and Payroll departments are advising on an unusual situation overwhelmed with challenges in taxation, payroll, and compliance. The challenge of safeguarding compliance with both local and international tax laws can lead to an increase in costs and a time-consuming process. Extreme care should be taken when hiring foreign workers, the experts at Euro Company Formations are well versed in the employment laws of every jurisdiction we operate. This article will outline the potential process and requirements for employing foreign workers abroad. Is the overseas employee working remotely (either from home or a rented space)? Is the overseas employee working in the field at client premises? Do you need to invoice clients in the jurisdiction that the employee is working in? Is the employee resident in the country where you want to employ him/her? Whatever the employment situation there are several aspects to consider when employing foreign workers abroad. Euro Company Formations can find the best solution based on the answers to these questions and the local laws in the jurisdiction that the company is looking to hire overseas employees. When a company wants to employ foreign workers abroad the company must register with the local agency in the country before it can legally become an employer. Otherwise, you may be in breach of employment laws, which could lead to substantial penalties. It is advisable to research the local employer registration requirements before hiring foreign workers. There are certain rules and regulation that apply to Employer tax registration in different territories and extra control must be taken into consideration. An employment contract in the local language may be required as well as employee benefits such as health insurance, disability insurance, pension or other regulations. New employees will need to be registered as well as general information such as the company’ name, Employer Identification Number and address. If your company has staff working in a foreign tax jurisdiction in a given year or relocating to a different jurisdiction for a period, ensuring compliance with local and international tax laws is crucial. Tax and social security applications for both employees and employers in the home and host country is the major consideration to follow. 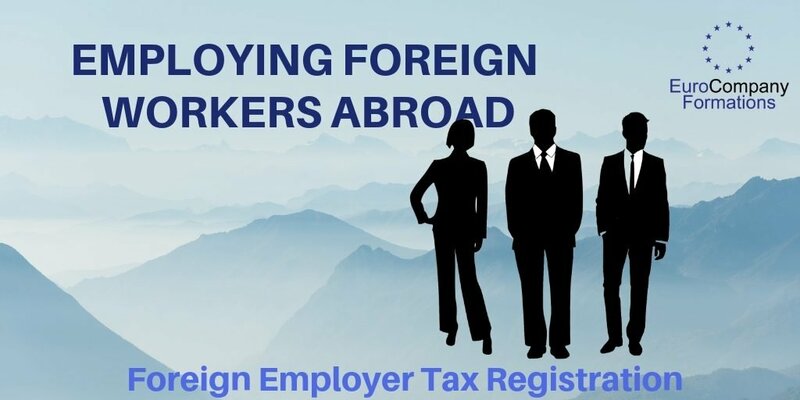 If you are interested in expanding your business overseas and need to employ foreign workers that reside in the new market Euro Company Formations would be happy to assist you with an application for Foreign Employer tax registration. We will prepare your application and ensure all required documentation is present before submitting to the Tax Office in the specified jurisdictions. Please note, some jurisdictions may have several regulations as regards to employer tax registration that we can assist you to meet. A few factors will have to be taken into consideration during this registration such as registered company, representative, transfer of taxes, registered office address, mandatory notifications to government agencies: new hires, terminations, contract transfers depending on the obligation of the countries desired. The timeframe for this application varies between 2-3 weeks subject to the Tax office in question. For more information on how EuroCompanyFormations.com can help you to register a foreign employer in another jurisdiction, please contact us. What are the implications of Brexit to Cross border trade? Comments Off on What are the implications of Brexit to Cross border trade? EuroCompanyFormations.com is a domain name of Euro-Wide Company Formations Limited. Registered in Ireland.